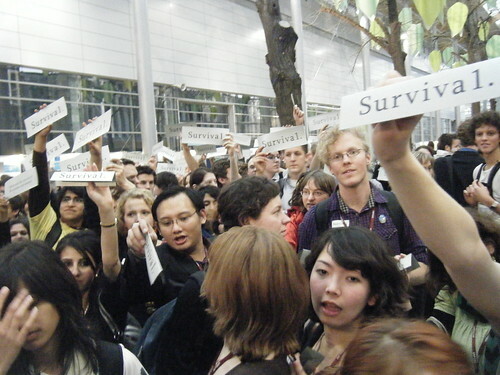 International Youth Climate Movement at the U.N. This video was made by Yong Ping Loo from Singapore from the last day of youth action at the United Nations Framework Convention on Climate Change (UNFCCC), the Conference of Parties (COP14). We’ve had an exciting victory, but we know we must continue to organize to make the implications of that statement meaningful – we know that any targets less than 350ppm will not insure the survival of all peoples and nations, and we know that any solution that is not equitable and just, is no solution at all. Click below for many more photos and reflections. Young people in Poznan, Poland are stepping into the empty shoes of our stalling government. Young people from the United States have been engaging full force in the 14th Conference of Parties (COP) of the UN Framework Convention on Climate Change (UNFCCC). Unfortunately, we can’t say the same of our government. Instead of waiting around for our government to change its tune on the international stage, we’ve decided to set up dozens upon dozens of meetings with countries across the globe, especially those countries whom our country has disrespected in the past. Even if our own government isn’t listening to some of the most affected stakeholders in this negotiation, we will. We’re hoping the next wave of U.S. engagement will follow our lead. Or just read the text of the U.S. letter to other delegations here. New activist resource guide! Tell stories through your work. <a href=”https://smartmeme.rdsecure.org/index.php”>smartMeme</a&gt; is an organization dedicated toward helping change-agents tell better stories with their activism and organizing. Story telling is the oldest form of human communication, and the most effective action, too. In their new resource guide, smartMeme helps activists shift ideas, culture, and the world around us. I can’t recommend it enough.